“MONARCHS-a migration story” — THE VIDEO!! At the Dance Media Movement Lab SCREENING Friday and Saturday 28 & September 29, 2018 at 8:30pm at Danceworks Performance Space 1661 N Water St.
Our 10-minute Monarchs, Mounds, Migrations video project has been accepted! The video blends performance video from Monarchs, Mounds, Migrations with outdoor dance sequences connecting sections of the monarch’s story from the performance. The video features the monarch’s migration journey including the glacier’s (aka Betty Salamun) and milkweed’s (aka poet Kavon Cortez-Jones) interaction with the monarch’s life cycle. 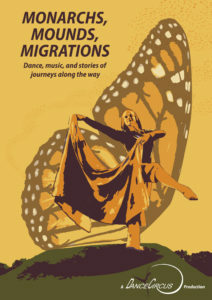 Join the Monarchs, Mounds, Migrations Dance Media Movement Lab Production Crew. Help us raise $2,000 to create this video. WATCH more information on Facebook. SIGN-UP TO RECEIVE OUR E-FLYER send an email to info@dancecircus.org. Dance, music, and stories of journeys along the way. with funds from the Wisconsin Arts Board.